I think ceramics is one of those fields that really favors patient people. My friends tell me all the time that I’m “very patient” – though admittedly they are usually making this comment after spending the day with me and my overly-exuberant youngest child. Maybe that kind of patience doesn’t translate to waiting for things to dry. Waiting until molds are dry enough to use, and until castings are dry enough to remove, is terribly difficult for me! So there are victims. This poor Finn got pulled out of his mold before he was dry enough, and his side collapsed. Things like that just aren’t worth the time they take to fix, so I crumpled him up. Normally he would have ended up the scrap bucket, but I must have missed him when I was cleaning. I found him this morning. Doesn’t he look so sad? 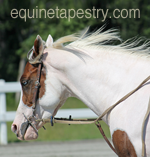 Actually, he almost looks like a horse all curled up to take a nap… if horses had no bones, that is. 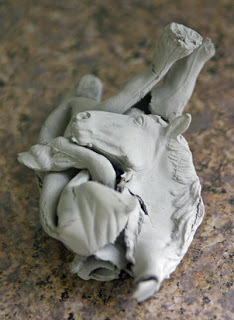 My husband tells me that my pile of clay looks like an equine graveyard! Joan used to fire hers and keep them all in a big glass fish tank beside the painting table. They were a bit unnerving to look at! Fire him up and glaze him Lesli! Bet there would be takers on him!